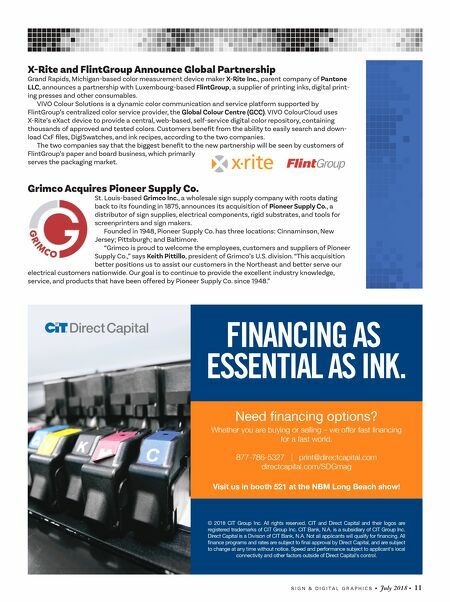 S I G N & D I G I T A L G R A P H I C S • July 2018 • 11 X-Rite and FlintGroup Announce Global Partnership Grand Rapids, Michigan-based color measurement device maker X-Rite Inc., parent company of Pantone LLC, announces a partnership with Luxembourg-based FlintGroup, a supplier of printing inks, digital print- ing presses and other consumables. VIVO Colour Solutions is a dynamic color communication and service platform supported by FlintGroup's centralized color service provider, the Global Colour Centre (GCC). VIVO ColourCloud uses X-Rite's eXact device to provide a central, web-based, self-service digital color repository, containing thousands of approved and tested colors. Customers benefit from the ability to easily search and down- load CxF files, DigiSwatches, and ink recipes, according to the two companies. The two companies say that the biggest benefit to the new partnership will be seen by customers of FlintGroup's paper and board business, which primarily serves the packaging market. Grimco Acquires Pioneer Supply Co. St. Louis-based Grimco Inc., a wholesale sign supply company with roots dating back to its founding in 1875, announces its acquisition of Pioneer Supply Co., a distributor of sign supplies, electrical components, rigid substrates, and tools for screenprinters and sign makers. Founded in 1948, Pioneer Supply Co. has three locations: Cinnaminson, New Jersey; Pittsburgh; and Baltimore. "Grimco is proud to welcome the employees, customers and suppliers of Pioneer Supply Co.," says Keith Pittillo, president of Grimco's U.S. division. "This acquisition better positions us to assist our customers in the Northeast and better serve our electrical customers nationwide. Our goal is to continue to provide the excellent industry knowledge, service, and products that have been offered by Pioneer Supply Co. since 1948." Need nancing options? Whether you are buying or selling – we offer fast financing for a fast world. 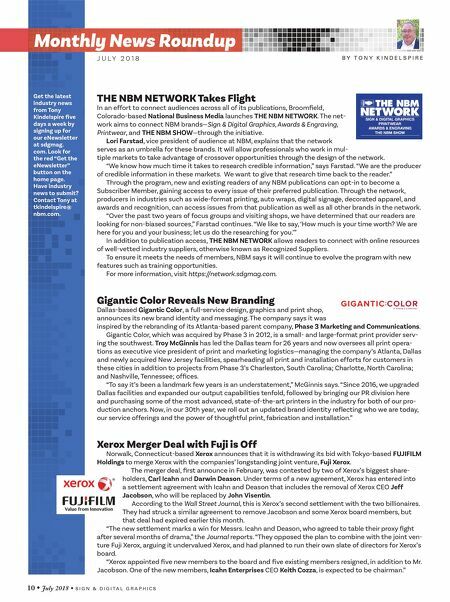 877-786-5327 | print@directcapital.com directcapital.com/SDGmag Visit us in booth 521 at the NBM Long Beach show! FINANCING AS ESSENTIAL AS INK. © 2018 CIT Group Inc. All rights reserved. CIT and Direct Capital and their logos are registered trademarks of CIT Group Inc. CIT Bank, N.A. is a subsidiary of CIT Group Inc. Direct Capital is a Division of CIT Bank, N.A. Not all applicants will qualify for nancing. All nance programs and rates are subject to nal approval by Direct Capital, and are subject to change at any time without notice. Speed and performance subject to applicant's local connectivity and other factors outside of Direct Capital's control.